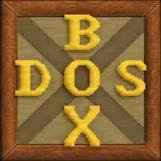 DOSBox SVN r4201 is released. DOSBox emulates an Intel x86 PC, complete with sound, graphics, mouse, joystick, modem, etc., necessary for running many old MS-DOS games that simply cannot be run on modern PCs and operating systems, such as Microsoft Windows XP, Windows Vista, Linux and FreeBSD. However, it is not restricted to running only games. In theory, any MS-DOS or PC-DOS (referred to commonly as "DOS") application should run in DOSBox, but the emphasis has been on getting DOS games to run smoothly, which means that communication, networking and printer support are still in early development. Improve prefetch and simple cores to not switch to normal core on trap execution. Fixes the demo version of Prehistorik 2 and similar cases that use the trap flag and prefetch tricks. Thanks NewRisingSun. Ensure room before adding environment variable using set. Noted when running a subshell under NC. Bug left: we don't have a lot of environment space in that case (not the 160 minimum). Refine stack overflow and underflow for the fpu a bit. Overflow is still treated as Exit. Underflow is ignored in release mode as it happens every now and then and doesn't seem to cause issues if ignored, thus restoring 0.74 behaviour. Correct bug related to signedness (M-HT).